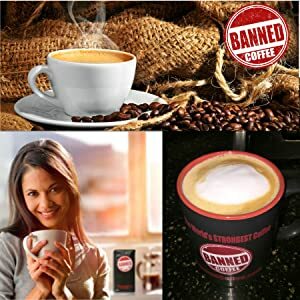 Clicking around Amazon and looking at their coffee products, I often see "Banned Coffee World's Strongest Coffee!" listed. Although I've actually seen many coffee brands claim that. I'm not sure how I'd measure that myself, but we'll take their word for it. Strong and Smooth Clean taste. Delicious bold flavor but never bitter with low acidity. Cupping Notes: Heavy Body, Smooth, Bold but never Bitter, Bright with a long finish and a notes of Berries and chocolate. Natural Source of Vitamins, Minerals and Anti-oxidants. The House Blend uses the strongest most delicious selections of fresh Arabica and Robusta Coffee Beans and Roasted to perfection by their highly qualified Master Roaster immediately prior to packaging. Every batch is tasted and is consistently the same. Great for coffee gifts, funny gifts, gift baskets, holiday gifts, college student gifts, office gifts, Valentine's Day gift or Birthday presents. Empower your day with something just as strong as an Energy Drink, but 100% natural that has Antioxidants, Vitamins and Minerals. STRONGEST MOST DELICIOUS COFFEE IN THE WORLD! More than 3 times the amount of Caffeine than popular Energy Drinks and 10 times the amount of servings. WILL JUMP START A RHINO'S MORNING! 1 Cup: YOUR BLOOD IS CAFFEINATED. 24 hours of work in just 30 minutes feels doable and child-like. Your speaking speed has tripled. 2 Cups: IT IS IMPOSSIBLE TO SIT STILL. You have 911 on Speed Dial. The room is spinning as if you have been KICKED IN THE HEAD by a Giant Donkey on blue meth. 3 Cups: You hear the craziest, fastest drummer ever. Glorious beats. No wait... That's your heart racing! ENERGY LEVELS ARE SO FAR OFF THE CHART that entering a Marathon wouldn't be fair to the other competitors. COLUMBIA, GUATEMALA, SUMATRA COFFEE. Made of rich, smooth, full-bodied, organic coffee beans. These exotic raw beans from around the world are blended and roasted to perfection. These Coffee Beans are the best you can get. A mix of Robusta (for the strenght) and Arabica (for the Flavor and Aroma). We have created this High End Gourmet blend of rain forest friendly coffee beans to ensure unique quality, but most importantly, the freshness of the coffee. ARTISAN ROASTED fresh to perfection on our small batch roasters, and roasted immediately prior to packaging. Every bag is consistently the same! 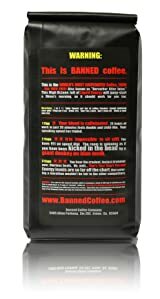 Whole bean coffee perfect for every coffee grinder or Ground Coffee ready for brewing! EMPOWER YOUR DAY with something just as strong as an Energy Drink, but 100% natural that has Antioxidants and Vitamins.